Home > How safe is it to visit the United Arab Emirates? Craig Webb, Security and Political Risk Analyst at Healix International comments on the risks involved when visiting the United Arab Emirates. 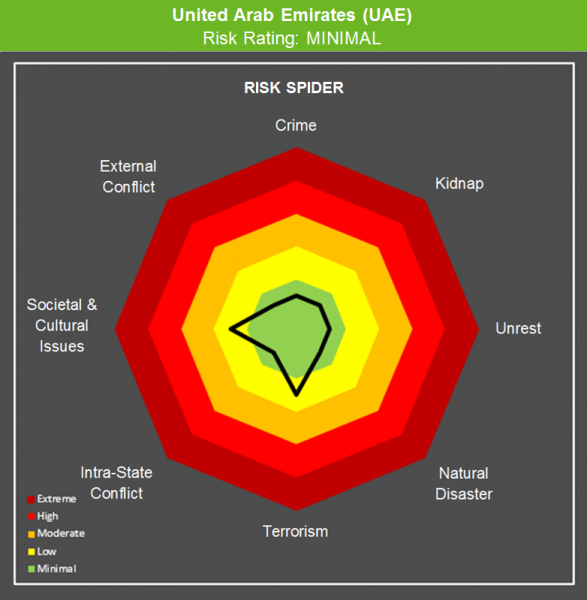 At Healix, we assess the UAE to be a MINIMAL security risk destination. The UAE presents a stable security risk environment and lacks any credible threat actors at the present time, meaning there are no elevated or reduced sub-regions within the country. Political stability is secure, with no organised political opposition groups capable of challenging the status quo or sowing widespread dissent, crime levels are low and the risk of terrorism (though fluid) is sufficiently contained by a capable security and intelligence infrastructure. Travel to the UAE can continue and does not necessitate the implementation of any specific security precautions, though prior research and the use of basic personal risk management protocols is always advisable. We utilise a market-leading risk-modelling tool called Risk SPIDER to calculate our risk ratings. The Risk SPIDER is both a quantitative and qualitative risk model that allows Healix to map political, operational, business and security risks based on a number of defined sub-categories. The SPIDER then presents this information in a digestible format and provides our clients with a more nuanced methodology for justifying risk ratings. It also allows Healix to carry out comprehensive and ad hoc risk reviews, with the SPIDER calculating whether changing the ‘Impact’ and ‘Likelihood’ of any one sub-category will affect the overall risk rating given for that country, which is calculated using a truncated mean of all sub-category ratings. As you can see from the below Security Risk SPIDER, we deem Societal and Cultural Issues and Terrorism to be the primary security risks facing travellers in the UAE. However, it should be stated that the aforementioned risk factors remain LOW and their comparatively high levels are reflective of an otherwise benign security risk environment where all other risk factors are rated as MINIMAL. 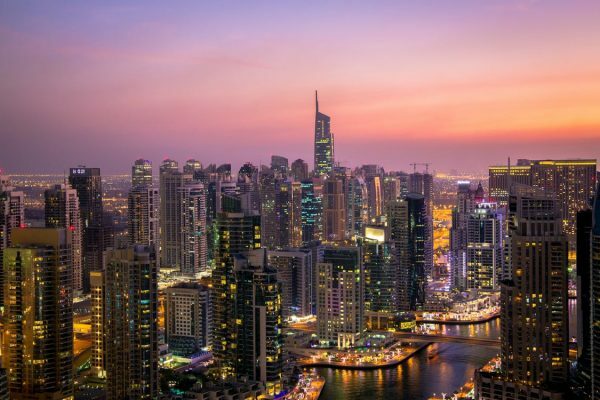 Despite its reputation as a regional business hub and its comparative tolerance when compared to other countries in the region, the UAE retains a culturally conservative undercurrent. As a result, travellers should be aware of the associated risks and take care to minimise the chance of inadvertently offending local Islamic customs. Most notably, female travellers are required to dress modestly in public places, covering all areas between shoulders and knees – though these requirements do not apply to private hotels, beaches etc. Most related infringements occur when travellers transition unknowingly between private areas and those deemed ‘public’ i.e. moving from a beach to a nearby bar or shopping centre wearing swimwear. The consumption of alcohol poses similar problems and drinking/being drunk in public areas is illegal and punishable by prison sentences or alternative, more draconian measures. Drinking in your hotel is permitted, though by the law you will require an emirate-specific personal liquor license – which are only issued to current UAE residents and denied to all Muslims – to drink elsewhere. As with conservative dress codes, most incidents occur when transitioning between legal and illegal areas, which becomes more of an issue when travellers’ judgements are impaired by alcohol. The authorities also treat all crimes committed whilst under the influence of alcohol extremely seriously. The risks posed by societal and cultural issues are further highlighted by the detention of a British tourist in July, charged with public indecency after allegedly touching another man’s hip whilst moving through a crowded bar. Following the incident, the authorities detained the individual for five days in Al-Barsha prison, before releasing him on bail and confiscating his passport. Though it is not credible in the UAE at the current time, owing to the highly capable security and intelligence apparatus, Islamist militant groups do pose a threat to all Gulf countries. Islamist extremist groups including, but not limited to the Islamic State (IS) militant group and Al-Qaeda in the Arabian Peninsula (AQAP) continue to publicly threaten Westerners in the Arabian Peninsula, and attacks targeting Westerners have occurred in neighbouring countries. The UAE’s pro-western foreign policy, large ex-pat population and the presence of significant economic targets increases its attractiveness as a potential target for militant groups. More liberal and high profile emirates including Abu Dhabi and Dubai possess the vast majority of attractive symbolic targets and therefore face a slightly higher risk than more conservative emirates such as Sharjah or Ras al-Khaimah. Owing to effective counter-measures, the most likely source of militant activity comes from lone-wolf actors who can be extremely difficult to detect. IS in particular has increasingly called for lone-wolves to conduct attacks using improvised weaponry, leading to numerous ‘inspired’ attacks in recent years. The use of unsophisticated tactics such as vehicle rammings and stabbings further complicates counter-terror policing and exposes possible vulnerabilities in almost all countries, including the UAE. Despite these considerations, the risk posed by terrorism remains LOW countrywide. Though our External Conflict risk rating is MINIMAL, Saudi Arabia’s (KSA) evolving counter-Iran strategy is potentially destabilising. The UAE is strongly allied with the KSA, and recent attempts to consolidate power by Crown Prince Mohammad bin Salman (MBS) further solidify the two countries’ closeness. The influence of strong ties between MBS and UAE leader Khalifa bin Zayed Al Nahyan is evident in the former’s attempts to diversify the KSA economy and return to a more moderate interpretation of Islam; some have described Al Nahyan as a mentor. The UAE has demonstrated a willingness to follow the KSA’s strategic direction and recent moves to confront Iranian influence in various regional theatres, including Qatar, Yemen and Lebanon underscoring an increasingly volatile regional landscape. These moves are further emboldened by the US Trump administration’s equally tough anti-Iran stance. As Iran continues to solidify its long-term influence in Syria, the KSA-led bloc will seek to challenge its political influence in other regional theatres, and this increases the risk of new proxy conflicts emerging. Whilst the UAE is unlikely to be directly affected by these conflicts, its supporting role in further KSA-led coalitions and a general escalation of regional hostilities may pose new travel risks over the coming months and years. In the rare case of detention, you should request your diplomatic representative as soon as possible. Intervention by an embassy or a consulate often resolves the situation quickly. Female travellers should cover shoulders, arms and knees in public; it is also advised to wear slightly baggy clothes and avoid open toed shoes. Take care to understand restrictions. If you are taking any prescription medication, ensure you check whether it will be allowed into the country as the UAE has strict medication restrictions. Similarly, you should clarify cultural sensitivities such as drinking laws/hotel boundaries with staff or trusted local contacts. Remain vigilant to suspicious behaviour and packages, particularly in the vicinity of priority militant targets such as symbolic Western locations (hotels, embassies etc. ), other potential targets such as security personnel and assets and all government infrastructure. In the event of discovering anything untoward, remove yourself from the immediate vicinity and report it to the security forces. In the event of any terror attack, remain calm and prioritise leaving the affected area immediately. Seek shelter in secure accommodation until the situation has stabilised. Developments should be closely monitored via local and social media. Employers should ensure that they have a detailed understanding of the operating environment that they are sending their staff to; usually, this means breaking down areas of exposure by geographic region and delegating responsibility to specific individuals in accordance with operational and cultural expertise. Alternatively, and perhaps preferably, employers can outsource this task to an organisation such as Healix, which has dedicated intelligence and operations teams, each with a direct regional focus. Building on from this, employers should ensure that their employees are briefed on the predominant security risks associated with their operating environment before travel, and advised how best to mitigate these risks. Where necessary, this should encompass a detailed travel security briefing and location-specific security training. Ensure that employees have a robust means of communication in order to communicate with their designated point of contact throughout the trip and that there is a robust travel risk management program in place covering all eventualities.